Do you allow visitors to watch your classes? I am visiting Juneau, and I study Aikido at another dojo. Can I train with you? Can my teenage child attend adult classes? My religion does not let me bow except to God, is that a problem? Are you affiliated with any national or interntional Aikido federation? What are your credentials for teaching Aikido? What weapons do you train with? Why do you use weapons if Aikido is called the Art of Peace? What do the symbols on your web page mean? Is Aikido the best martial art? Answers to more questions about Aikido can be found at the Aikido FAQ website. Check out our Info page for details about becoming a student at Juneau Aiki Dojo. To find out if Aikido is what you are looking for, we encourage you to come to the dojo and watch a class. Yes, with a few exceptions, visitors are welcome to come and watch a class. Watching a class is the best way for prospective students to determine if they want to start training. If you want to watch a class we ask that you come a few minutes before training starts so we can greet you and show you where to sit. You can check the schedule for class times. Once the class starts we won't really have time to talk to you, but at the end of class the instructor and all the students will be happy to answer any questions you have. Yes, we are always happy to have visitors from other schools. We have a $10 mat fee for training in occasional classes, and if you are in Juneau for an extended period you can pay regular monthly dues, we don't have any registration or annual fees. Yes. In fact, a large percentage of the students at Juneau Aiki Dojo are women. Some of our senior students are women. They provide excellent role models for beginning students who are female, and really for all students. Juneau Aiki Dojo has two levels for dues. Regular dues are $80 per month. Dues are a flat rate no matter how many classes you attend in a month. This rate is about average for Aikido schools. Many schools in large cities such as New York charge much more. Some schools charge less, but many of them have a more limited class schedule, only allowing students to train two or three days a week. Many schools charge an initial registration fee, and annual affiliation fees. We don't charge for either of those. Some students have work, school, or other commitments that limit the number of classes they can attend. We have a $50 per month dues rate for these students. The $50 rate allows the student to attend 2 classes per week. See our information page for more information about dues. Not at this time. Aikido is a wonderful activity for kids, but children's classes are a bit different than adult classes, particularly where weapons are concerned. In the future we may well have children's classes, or family classes where parents and children train together, so check back with us occasionally. Generally no. We might make exceptions where a parent is a serious student of Aikido and wants their child to share their avocation, but even then we would have to limit that to older teens. My religion does not let me bow, except to God, is that a problem? No, that is not a problem. Keller Sensei's first Aikido teacher, Yousuf Mehter, is a devout Muslim. In keeping with his religion, Mehter Sensei didn't have any photographs on the walls of his dojo, and didn't allow bowing. At the beginning and end of training, when traditional classes bow to the shomen and the sensei, he instead had students acknowledge him with a slight nod of the head. You can do the same in our classes; replace the bow with a nod of your head. We are flexible about this. However, we require that you be flexible, too. We bow as a part of the formality of our practice, and will continue to do so. The bows are distinctly Japanese, but are more cultural than religious. The formality of the bows at the beginning and end of class comes from Shinto, because the Founder was a devout follower of that religion. We are not Shinto, so we modify the meaning of the bows, while retaining their form. When we bow in at the beginning of class, we bow twice, clap twice, and bow again. The symbolism for us is that the first bow is for leaving the everyday world. The second bow is for entering the Aikido world. We strive to leave our everyday problems and cares off the mat, and to be fully in the Aikido world during our training time. The two claps are to attract and center our attention, so that we are focused during class, and afterward, when we go back out in the world. The final bow is done to show respect to the teacher, and to the teachers who came before in our lineage, all the way back to O-Sensei. No, Juneau Aiki Dojo is not affiliated with any national or international organization. Ultimately organizational affiliation is a side issue; the transmission of Aikido takes place between the teacher and the student. While training under Bill Sosa Sensei, Chris Keller was awarded a Sho-dan in 1987 and a Ni-dan in 1990. Those dan certificates were issued by the Seidokan Aikido organization. In 1990 he received a Moku-roku, a traditional transmission scroll, from Morihiro Saito Sensei in Iwama, Japan. Transmission scrolls are common in many traditional Japanese martial arts, but less so in Aikido. Not at Juneau Aiki Dojo. Unlike many Aikido schools, but similar to other traditional Japanese martial arts, there are no ranks at Juneau Aiki Dojo. The kyu-dan ranking system was actually created as a player ranking system for the game of Go, in the seventeenth century. It was adapted to the martial arts by Jigoro Kano, the founder of Judo, in the eighteen eighties. Kano introduced the familiar black belt. Rankings have considerable value in competitive martial arts since they allow competitors to be matched to opponents of similar skill in tournaments. They are also useful for organizations with many dojos. The founder of Aikido only began awarding dan ranks after years of teaching, when he had schools scattered across Japan. Juneau Aiki Dojo is not affiliated with any larger Aikido organization, and we don't have competitions, so we have reverted back to the older, and simpler approach. The measure of our Aikido is the personal internal development and skills of each student. Like many worthwhile pursuits, the important thing is not the goal, but the journey. We train with the bokken, which is the wooden sword; the jo, which is the short staff; and the tanto, which is the wooden knife. These are the traditional weapons used in Aikido training and the ones that Saito Sensei trained in and emphasized in Iwama. We do limited training with the yari, which is the Japanese spear, the naginata, another pole arm similar to the European glaive, and the juken which is the rifle with bayonet. O-Sensei taught juken in the pre-war years, and we have good photographic and video documentation of his teachings. He also trained with the yari in the early years. Learning to use long weapons helps illuminate some of the principles that are at the core of Aikido. We do some training with the cane. We train with weapons because the founder of Aikido trained with weapons. O-Sensei believed that weapons training was important, and did quite a bit of the development of Aikido weapons during his years in Iwama. Saito Sensei carried on the emphasis on weapons training, and systematized the weapons aspects of Aikido for us. The real answer to this question gets to the heart of Aikido. Aikido is called the Art of Peace because O-Sensei taught us to control ourselves as well as opponents. To truly practice refraining from violence you need to have the ability to do violence. When practicing weapons with our training partners we need to have strong and unwavering focus to prevent accidental injury. That training helps foster the ability to overcome our own human nature as well as an opponent if we ever find ourselves in a physical confrontation. Generally no. When the dojo was the VFW Hall it was available for receptions, parties, and other events. To do so now would require that we pick up and replace the mats, increasing wear and tear. Also, a dojo is considered a sacred space, set aside from ordinary purposes for pursuing a Way. We make the dojo available for other martial artists under certain circumstances. The downtown Tang Soo Do class currently meets at Juneau Aiki Dojo, and we may make the Dojo available to other martial arts for special occasions such as seminars. The dojo is still evolving, and we will be adding more classes in the future, so ongoing unused times are not certain. The symbol in the upper left hand corner of the page is representative of a kamon, a Japanese clan or family crest. 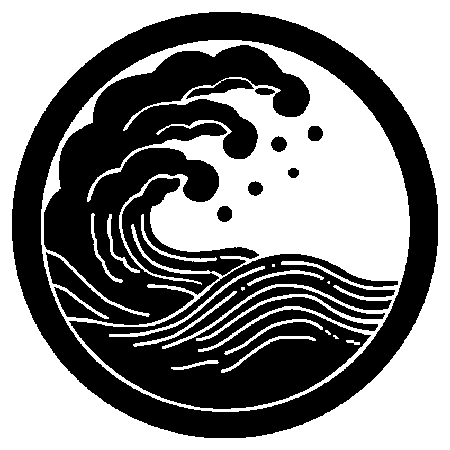 Our kamon is a nami, or wave, motif. It represents the principle of the wave that is common in Aikido and Aiki-jujutsu. Our kamon is derived from a traditional Samurai kamon. Examples of traditional Samurai kamon are available on the Crest Japan website. The kanji, or ideograms beneath the kamon spell out Aikido. The first, Ai, means harmony. The second, Ki, means spirit. The third, Do, means road or path, but is more commonly translated as “Way”. The triangle, circle, and square in the upper right-hand corner of the page are common symbols in Zen and Shinto. The eighteenth century Zen monk Sengai Gibon painted a famous depiction of the triangle, circle, and square called "The Universe." O-Sensei frequently referred to the triangle, circle, and square, and they are closely associated with Aikido. One of the first Americans to train with O-Sensei in Japan was Terry Dobson. He once asked O-Sensei the meaning of these symbols. O-Sensei's answer was, "Figure it out for yourself." We strive to take that advice. That depends on your assumptions. Our friend Toby Threadgill has written an excellent essay on this topic. Briefly put, every martial art is based on assumptions about how it might need to be used. Sport martial arts have assumptions about the rules that practitioners will be subject to in the ring. Martial arts taught to combat soldiers have different assumptions. The assumptions of Aikido come down to us from the Founder. They involve a belief that Aikido can help reconcile conflict at all levels of human interaction, and that the most important victory is victory over ourselves and our own human nature. No, you've got us. Although some of these questions do get asked, this is mostly information that we think you should know if you are at all interested in Aikido. Thanks for asking.